In this 2d part of our focus on Ginsburg, we'll take a look how frequently Ginsburg has been in the Court's majority, and how frequently she has taken a position at odds with that adopted by the Court. In short, the frequency with which she has been on the winning and losing sides of the Court's decisions. First, how often has Ginsburg been part of the Court's majority? 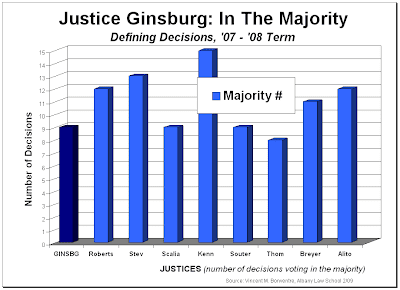 Graph 1 shows the number of "defining decisions" in which the Court adopted the same position that Ginsburg voted for, and for comparison purposes, it shows the same for each of her colleagues. 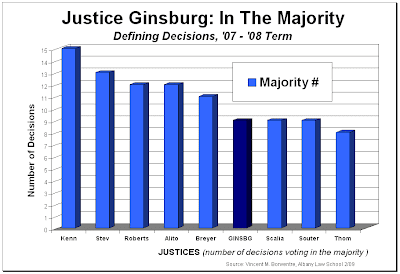 As Graph 1 makes clear, Ginsburg has not been part of the Court's majority nearly as often as many of her colleagues. She has voted with the majority considerably less, for example, than Justices Anthony Kennedy and John Paul Stevens and Chief Justice John Roberts. Placing Ginsburg's record among those of the other Justices, in order of frequency in the Court's majority, underscores the extent to which Ginsburg has typically not been part of the Court's governing coalition. This is depicted in the next graph. Looking at the flip side of this--i.e., looking at the dissent records of Ginsburg and her colleagues--provides another perspective. Same data, different view. It underscores how frequently Ginsburg opposed the Court's decisions, and how her record in that regard compares with that of her colleagues. Take a look. 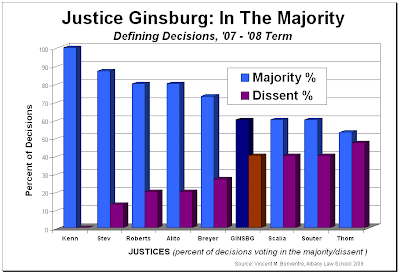 Let's put all this together--majority and dissent records, Ginsburg and her colleagues--and do so in rates, i.e., percentages. It's a picture that says an awful lot about Ginsburg and her colleagues, and about who has typically been part of the Court's winning coalition and who hasn't been. Compare Ginsburg's record to Kennedy's and to Thomas's. Kennedy has clearly been winning, or at least he's been voting on the winning side of the Court's decisions. Indeed, in 100% of the "defining decisions." Ginsburg, by sharp contrast, has been winning, or voting that way, much less frequently. The flip side is that while Kennedy was never in dissent in these cases, Ginsburg was quite frequently. 40% of the time. On the other hand, Ginsburg's majority/dissent record is close to that of her ideological opposite on the Court, Thomas. 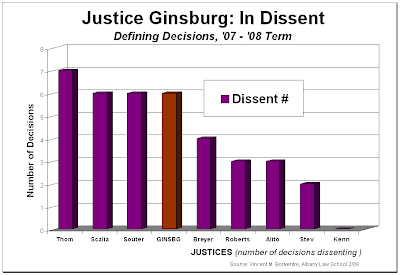 Her relatively low rate in the majority and high rate in dissent are not much different than his. Thomas's majority/dissent record is at the opposite end of the Court's spectrum from Kennedy's, and Ginsburg's record resembles Thomas's much more than it does Kennedy's. Indeed, the only Justice on the Court with a lower majority rate and higher dissent rate than Ginsburg is Thomas. And her majority rate is not much higher-- her dissent rate not much lower--than his. In the next post, we'll take a look at how frequently, or infrequently, Ginsburg voted on the same side with each of her colleagues. In short, which Justices have been her usual allies, and which her usual adversaries.